I was sitting here in the dark last night, nervously hand stitching on a block while watching a PBS show about Kennedy, waiting to hear news of my MIL's surgery, when it occurred to me...I have never shared one of my favorite tools that allows me to stitch ANYWHERE...the fantastic light that hangs around my neck. It is called "Beam and Read" and there is a phone number right on it (but I also found it here on www.Amazon.com). I am able to keep the switch in the "off" position while it is flat (as pictured above)...then just swivel the light head to the angle I want (it comes on automatically when the head is swiveled). I guess if you wanted to use it in the flat position, you could just turn it to the "on" position. I love this thing!! There are different versions, but this one has 6 little LED lights that are wonderfully bright...there are less expensive versions that have 4 LED lights, but I like how bright this one is. It came with a colored filter to snap over the lights, but I have never used that...also came with a magnifying lens that you can snap on, but I don't use that either. It takes four AA batteries, does not generate heat, and only weighs a little over 6 ounces. I can sew in a dark room when my family is watching a movie, sew in bed, sew during meetings, sew ANYWHERE!!! I used to use the clip-on book lights, but found those terribly inconvenient...the clips were clumsy and the lights not very bright...and they used those hard-to-find round/flat little batteries. I would clip them on my hoop while hand quilting, which was clumsy...this is WAY better. that I found at a junk shop over the summer. On an unrelated topic, I was overwhelmed by the responses to my last post...thank you! Really, I promise I wasn't fishing for comments, but simply puzzling out all the things I don't understand about blogging (ha! which is everything...). I never worry about the number of comments, but do, from time to time, check the stats for the number of page hits. The blog readers do cut into those statistics. Someone emailed me and told me how to determine the number of people who follow me on Bloglovin'. And for grins, I signed up to "follow myself" on my own blog. This morning, I got an email with that last post in it, which can be read without ever going to my blog. Interesting. That makes reading a particular blog very nice and convenient, but no button for commenting, so THAT explains a lot...if I had an iPhone or iPad I would love that little convenience. What was I thinking when I dragged THIS home over the summer? 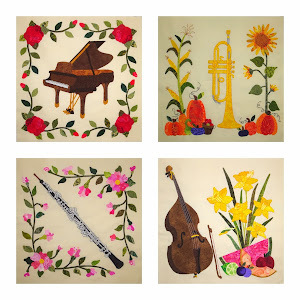 I have no intention of stopping what I do...I appreciate and really enjoy...the online quilting community, even when I don't really know who is out there. Google and Blogger have never made it easy for people to comment in the first place. I guess Facebook makes it easier for people to communicate with each other, or simply "like" something, and I do have a Facebook page (which is so neglected and not up-to-date at this point...). 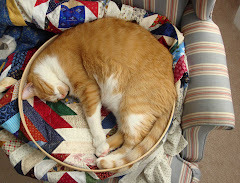 My husband says I should start another one that just has to do with my fledgling pattern business and quilting. That light looks like it might be a perfect Christmas gift for my parents who do a lot of reading when they travel and might not have good lighting. Haha, we have a big sliver Tuba sitting in our lounge! Does the light hang from your neck?? I'm going to consider that 'lil light. An ipad is easier to read blogs than the iphone due to the larger screen, and you won't have an expensive monthly cell phone bill. A few minutes stitching here and there do add up. The light looks like a great tool for doing cross stitch too. I follow a lot of people, wander by their blogs but don't always comment. hii very nice article... i love your bloags and regularly visit. please explain me about how whatsapp server works https://techgigi.com/slim-battery/. This article i read but i am very much confused.. please help! !